Here at Tathra Beachside we believe that pets are a part of the extended family and therefore we are more than happy to welcome your pooch to the park. Pets are welcome all year on our sites except for the first 2 weeks of our Christmas holiday period. Pets are welcome all year in our Pet Friendly Cottages with no exclusions. Guide dogs are always welcome any time of year. We do require that all dogs are registered and microchipped. When outside your van, your dog must be kept on a leash at all times. Any disturbances such as barking, are to be kept to an absolute minimum to ensure that other guests are not inconvenienced. You are responsible for cleaning up after your dog. Poop bags available at reception. 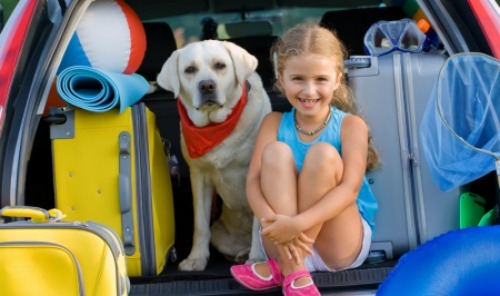 Dogs are not allowed in our amenities, camp kitchen, water park & swimming pool area, playground and laundry with the exception of guide dogs. You agree to be responsible for all property damages and/or personal injuries resulting from your dog. You further agree to indemnify and hold harmless Tathra Beachside, its owners and operators, from all liability and damage suffered as a result of your dog. Dogs are only allowed on the vinyl floors of the cottage at all times (kitchen/dining areas). Dogs are not allowed on any of the carpeted areas or on any of the beds or bedding. Any evidence of dogs in these areas will incur an additional cleaning fee equal to one nights accommodation. Your dog must be kept on a leash when being exercised around the park.